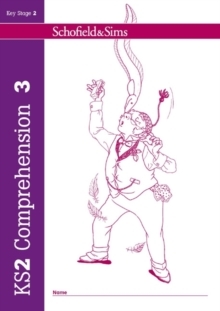 Key Stage 2 Comprehension provides a unique collection of stimulating texts that appeal strongly to both boys and girls, together with questions that both build and stretch comprehension skills and widen vocabulary. Comprising four one-per-child activity books and providing more than 72 texts in total, the series encourages children to pay close attention to literal meaning, make inferences and deductions, observe how writing is structured and identify literary devices. A separate Teacher's Guide is also available. Book 3 encourages children to move beyond simple understanding and recall to look for more complex meanings. It includes: adventure stories from Roald Dahl, Mark Twain, Anthony Buckeridge and Kenneth Grahame, an inspiring biography of Falklands soldier Simon Weston, further non-fiction from Jacqueline Wilson and Emmeline Pankhurst, evocative poems from some of the best British poets (such as Lewis Carroll, Robert Browning and R.L. Stevenson), an appealing letter written by Stevenson as a teenager and an introduction to the writing of J.R.R.